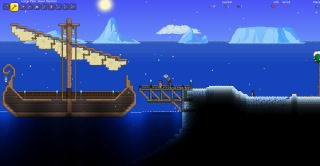 If you're into Terraria, you might be aware of Super Terraria World, a standalone mod that morphs Re-Logic's sandbox survival game into a proper RPG, complete with quests, NPCs, skills, and other RPG-y things in a fixed world. If you weren't aware, then you should probably follow this link, before cancelling all your plans for today. Super Terraria World has just been updated to version 1.12a; there's a Patreon campaign and a new, 'official' trailer showing the ambitious mod off. As explained over on Reddit, 1.12a "brings STW to the current code base of Terraria (1.3.3.2)". It also adds a new friendly NPC, an additional, chilly player-owned world, "leaf particles while using the Magic Leaf", an updated spear ability, revamped Mana regen logic and more. The end goal of the team is for the mod be an MMO, but for now it's single-player only.